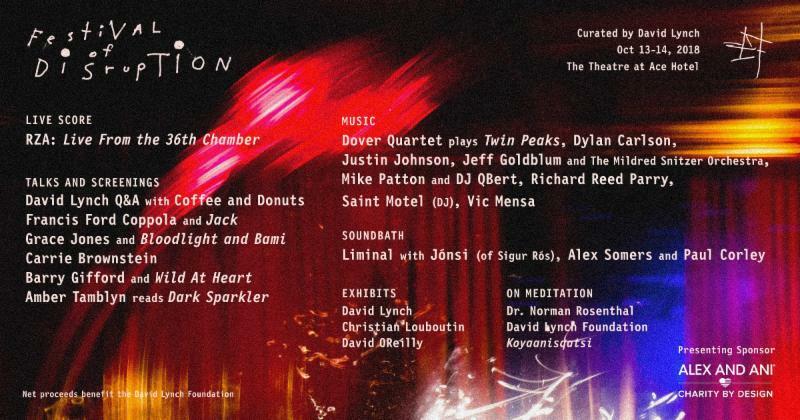 David Lynch’s Festival of Disruption takes place again in Los Angeles this year on October 13-14 at the Theatre at the Ace Hotel. The lineup for the fest has just been announced and includes RZA: Live from the 36th Chamber—live scoring the 1978 film The 36th Chamber of Shaolin—plus Liminal Soundbath, a project featuring Jónsi of Sigur Rós, Alex Somers and Paul Corley. Also on the lineup are Vic Mensa, DJ Qbert and Mike Patton, Jeff Goldblum and the Mildred Snitzer Orchestra, Saint Motel (DJ set), Dover Quartet, Earth’s Dylan Carlson, Arcade Fire’s Richard Reed Parry and Justin Johnson. There will also be talks and readings from Francis Ford Coppola, Grace Jones, Carrie Brownstein, Barry Gifford, Amber Tamblyn and David Lynch himself, as well as a screening of Koyaanisqatsi. More performers will be announced in the coming months, and net proceeds from the festival will benefit the David Lynch Foundation. Tickets will be available beginning on June 20 here. Read our feature, Welcome to the Black Lodge: The Music of David Lynch.